It was gratifying to see a room full of eager scientists, creators, and storytellers celebrating with us the ways that the Media Lab helps create the future, as well as the ways science fiction helps us envision the future we should create. I dedicated my first Comic-Con panel presentation to actress and activist Nichelle Nichols, who originated the role of Lt. Uhura on Star Trek. I was fortunate to meet Nichelle in 2011 while attending a NASA student conference in honor of the final Space Shuttle Launch. It was then I learned that Nichelle is not only a trailblazing actress who was one of the first black women to portray a technical professional on a popular television show. She was also a civil rights activist who helped NASA recruit the first minority astronauts. 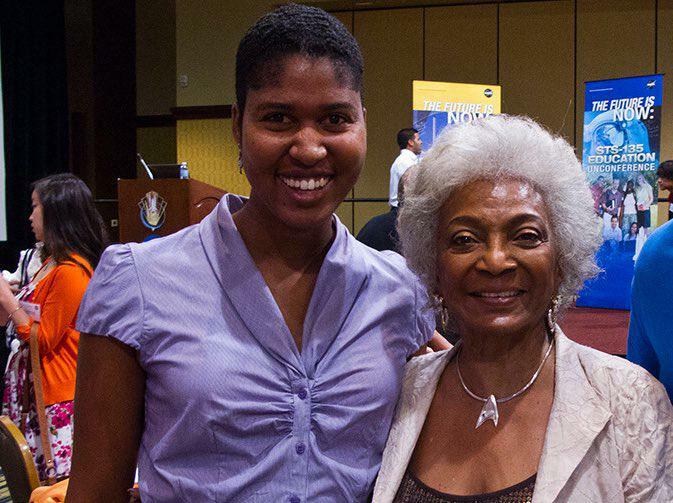 Nichelle helped us envision and create a future in which people of all races explore space. During our Comic-Con panel, I introduced the work of my research group, Space Enabled, at the MIT Media Lab. The mission of Space Enabled is to advance justice in Earth’s complex systems using designs enabled by space. Our message is that technology from space can support the United Nations 17 Sustainable Development Goals; however, more work is needed to make space technology more accessible and affordable. The Space Enabled research group brings together six disciplines to create space applications for development, including design thinking, art, social science, complex systems modeling, satellite engineering, and data science. Danielle Wood dedicated her first Comic-Con panel presentation to Nichelle Nichols, whom she met in 2011 at the final Space Shuttle launch. As I prepared for Comic Con, I explored the work of women of color who are documenting inspiring history or helping to define an anti-racist future. I am currently reflecting on the work of Margot Lee-Shetterly, Zora Neale Hurston, and Nnedi Okorafor. Margot Lee Shetterly is a historian who recently brought us the story of NASA’s Hidden Figures, sharing the achievements of black women who worked as computer scientists and mathematicians while helping achieve the first American human space flight missions. Zora Neale Hurston wrote as an anthropologist, historian, poet and novelist in the first half of the 20th century. She revolutionized scholarly approaches to depicting southern black culture by unabashedly sharing the folktales and cultural richness of the communities that shaped her. She overcame the racist roots of anthropology by defining her own approach to preserving community culture via academic research. I have just read the newly released work by Hurston called Barracoon, in which she interviews the last surviving person who was captured as a slave in Africa and forced to labor in the United States. Nnedi Okorafor writes about a future in which a young African woman draws on her deep brilliance in mathematics while having inter-planetary adventures in space. Nnedi is part of the movement of those who help us envision a future world in which the current patterns of colonialism are no longer dominant. I constantly learn how to think more clearly and pursue my research with more intention as I build on the work of these historians, futurists, and visionaries.